What are the recent tendencies, facts, and numbers in healthcare spending in Canada? In the following article we will explore these. What is the role of government in healthcare in Canada? The health services in Canada, as well as the supervision of the providers is the responsibility of each particular province. There are governing institutions within each province that oversee the funding and delivery of hospital, community healthcare, long-term care, mental and public health services. The co-financing of health provincial programs is on the federal government. These programs strictly comply with the Canada Health Act, which is updated on a regular basis to include all recent developments in modern healthcare. How is insurance financed in Canada? Let’s look at the facts and numbers on how insurance is financed in Canada. Around 70 percent of total health spending in Canada comes from public sources. The provinces have their own universal health insurance programs, covering all local residents. The major sources of funding are general provincial and territorial spending, which was around 95 percent of public health spending in the year 2018. The federal government provides funding to the provinces and territories through the established Canada Health Transfer. These funds amounted to around CAD 36 billion in 2017–2018. Around two-thirds of Canadians hold private insurance. Private insurance usually covers those healthcare services that are not covered by public reimbursement. The popular privately covered services include: dental care, prescription drugs, vision-related, rehabilitation, home-care. In 2018, approximately 95 percent of premiums for private healthcare plans were obtained through employers or organizations that belong to a group contract or non-insured contract. In 2018, private insurance constituted around 15 percent of total health spending. Cost-sharing does not exist in Canada for publicly insured physician and hospital services. Prescription drugs provided by hospitals are covered publicly in Canada. Physicians in Canada do not charge patients for anything that is above the negotiated fee. 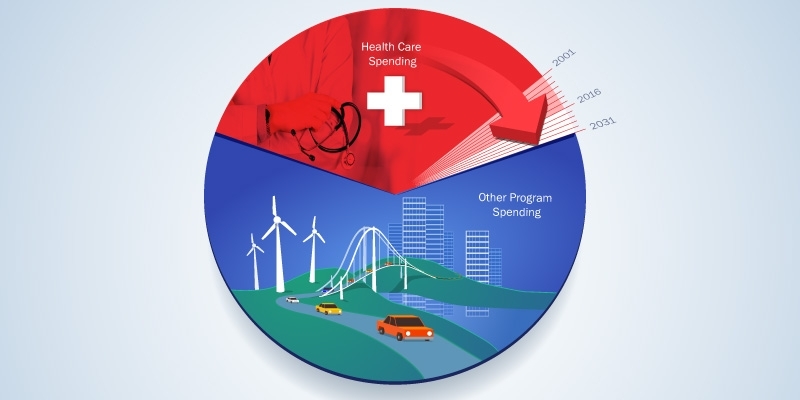 In 2018, out-of-pocket spending was at about 15 percent of total health spending. In 2018, there were 2.28 practicing physicians per 1,000 citizens, With around 50 percent of these general practitioners(1.15 per 1,000 citizens), and fifty percent specialists (1.13 per 1,000 citizens). In 2018, 47 percent of general practitioners reported to work in a group practice, 20 percent in an inter-professional practice, and 16 percent in an individual practice. Individuals have complete freedom of choice who would be their primary care doctor. Clinical fee for service to primary care doctors in Canada averaged CAD 271,417 in 2017–2018. Hospitals in Canada are responsible for the majority of specialist care. There is a recent trend, however, of providing services in private non-hospital places. The amount of non-hospital specialist care is expected to grow steadily in the coming years. Medical specialists in Canada, in 2017-2018, received an average of CAD 400000 in clinical fee-for-service reimbursements. In Canada, in the majority of provinces, medical specialists are under the same fee schedule as primary care physicians. In 2018, 62 percent of medical specialists had been working in hospitals, while 26 percent of medical specialists admitted they were employed by a private office. The majority of medical specialists bill provincial governments, while there is a certain percentage of specialists who are on a salary paid by a hospital. There are no existing direct payments from patients to specialists. After-hours care is provided usually by medical specialists-led walk-in facilities as well as by hospital emergency facilities. In most provinces, a free telephone service (also known popularly as “telehealth”) is available 24/7 for a competent urgent advice from a nurse. Primary care physicians are not required to provide after-hours care, while there are many of the government group-practice arrangements which are under requirements or financial incentives for providing after-hours care to patients. In 2018, around 50 percent of primary care physicians admitted that patients addressed them with an after-hours request. Hospitals in Canada have always been a mix of public and private establishments, Hospitals are usually not-for-profit, while being managed locally by municipal authorities and at times specially designated community hospital boards. In provinces where regional health governance exists, hospitals are usually publicly owned, while in other provinces, for example Ontario, hospitals are usually private. There is no existing data on private for-profit local clinics. These are focused on diagnostics and surgery. Hospitals in Canada are usually under annual global budget, which is set by the provincial ministry of health or equal entity. Some provinces, including Alberta, Ontario, and British Columbia, are about to launch activities-based funding for local hospitals. Hospital-based medical specialists are usually not employed by a hospital and earn their wages with fee-for-service formula.